By Carol L. Cheatham, Ph.D. Between February and May of this year alone I traveled over 175,000 air miles. I have been from the Philippines to Sweden, from China to Germany. Where do I begin to tell you about the things I have learned, the people I have met, and the children I hope I have helped? I could start by describing the heartbreaking realization that the air pollution in China is so bad that there are children growing up there who have never seen the sun, but I won’t. I could start by telling you that in Turkey, I was able to teach many health care professionals from across the Middle East including Saudi Arabia, Iraq, and Iran about the need for proper nutrition during pregnancy to optimize fetal brain growth, but I won’t. I could start with any number of profound happenings, but I have decided to describe to you some research about which I heard at the International Conference on Infant Studies in Berlin. It is not often any more that research knocks me off my feet (I can think of only two instances in the last six years). This research with non-human primates (i.e., monkeys) did just that. I would like to introduce you to Ai. In Japan, a scientist by the name of Tetsuro Matsuzawa (http://www.kyoto-u.ac.jp/en/research/forefront/message/rakuyu11_a.htm for a short biography) has been working for 30 years with Ai, a chimpanzee and her offspring. Ai learned at an early age to recognize symbols on a keyboard and to name objects and colors. She and her kids have also been taught numbers and number order. For one number task, these chimpanzees are trained on a touch screen television. Numbers from 1 to 9 are presented on a screen in random order and in random places on the screen (see photo A). The chimps touch the numbers in ascending order to receive a treat. This skill is amazing in and of itself, but not that the chimps learned to do it – it is amazing that the scientists had the patience and fortitude to teach them. It was a very time and labor-intensive endeavor. Here is the knock-your-socks off part: these chimps can still successfully complete the task when the numbers disappear the instant the chimp touches the number one! Let me say that again – in more detail this time – the numbers from 1-9 come up on the screen in random order and in random places on the screen. The chimp’s job is to touch the numbers in order. 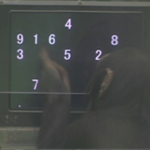 The instant that the chimp touches the number one (see photo A), the other numbers disappear behind white boxes (see photo B), and the chimp must finish the task basically blind. 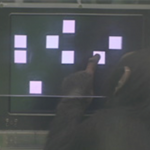 The chimps in this “masked” task are still successful even though they only saw all nine numbers for a split second. To put this in perspective, humans who are tested on this masked task can only touch the first three or four numbers correctly. Mind you, this skill cannot be taught. The brain has to encode the numbers and their positions in a flash and be able to recall the position of numbers. Why don’t humans have such a flash memory? Dr. Matsuzawa hypothesizes that language gets in our way. Basically, our brains get bogged down by attaching words to the numbers – a problem that the chimps do not have!! Finding out about this research has had me devising ways to test it in humans as well as trying to explain it in chimps. Why would chimps need flash memory? Can the human brain work similarly? How would we test that question when our lives are so tied to language? The questions and possibilities are endless. Maybe one day I will have the time to do the research. In the meantime, I hope you enjoyed thinking about it as much as I did.